Through this journal, we learn how, through faith, the aid of family and friends, the support of health care workers, and the inspiration of fellow cancer patients, one individual was able to overcome her disease. ~ Stuart L. Goldberg. M.D. Rebirth is a truly inspiring book about a young woman's struggle with leukemia. Ludwig's use of journal entries vividly portrays each phase of leukemia with her hopes, disappointments, and triumphs. 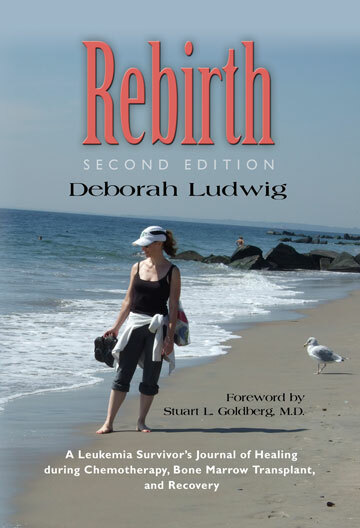 From diagnosis to remission, readers experience Ludwig's emotional search for answers, peace of mind and passion to fight for her life through her discovery of the powers of modern medical treatments, faith, and family. I would recommend Rebirth to anyone who knows anyone dealing with cancer, which unfortunately is so many people these days. The book will shed a lot of light on what it's like fighting the battle with cancer day-to-day. It was interesting reading this book now, since I am currently taking a Stress Management elective class in my Counseling Master's program. One of our required reads for the class was The Power of Now by Eckhart Tolle. Rebirth was the perfect complement to the class, because it was like I was experiencing the direct, practical application of some of those concepts (living in the present moment, using meditation and spirituality to clear your mind of thoughts, etc.) through reading about Deborah's utilization of those techniques during her battle with cancer. So powerful! I am writing to thank you for opening up your journal and allowing me to experience the other side a little better. I don't know what is it to be in your place or any other patient at the cancer center. Your journal enabled me to really get a good insight into what you were truly feeling. I truly love my job and reading a book like yours makes me love it even more. Some days are certainly harder than others, depending on what the day brings. Deborah Ludwig’s Rebirth is phenomenal! Inspirational and deeply personal, the author effortlessly shares her innermost thoughts about her battle with leukemia, in such a way that you find yourself cheering her on from one journal entry to the next. You’re pulling for her to respond favorably to the myriad medications, hoping the results of her latest blood work allow her to continue moving forward in treatment, and deeply moved when she or they do not. At the same time, she weaves in medical terminology that anyone with such a diagnosis must learn – allowing the reader to gain insight into the foreign, tumultuous world of chemotherapy and bone marrow transplant. From the very first entry, you’re engaged with the author’s drive and desire to win over Leukemia – realizing the self-exploration and awareness that must occur along the way. As she chronicles her yearlong battle, the profundity of what she faces sets in. In addition to juggling her finances, her plans for a career, and getting on with everyday life – she’s fighting for her life, one day at a time. What an amazing journey – enlightening, insightful, and moving – a must-read for anyone struggling with a life-threatening illness or for those trying to support a loved one through the ordeal. To know Deborah personally is truly an honor and a huge blessing. The song lyric, A Hundred Little Miracles Are Happening Everyday (from the Flower Drum Song movie) is the closest description of how I picture her. To interact with this Miracle almost on a daily basis gives much more meaning to life after reading Rebirth. How many times has anyone of us encountered a cancer survivor? The answer to that question has made me much more humble and much more appreciative for the little things in life I took for granted. Deborah is my daily reminder! Her passion to help others who are suffering through the same ordeal is absolutely amazing and has become her calling. She has touched my life in a profound way and I can guarantee that she will touch yours. They say miracles will overtake you. Deborah's Rebirth surely will. Deborah Ludwig is a true embodiment of having traveled through the dark night of the soul and emerging as a raw, compassionate and radiant butterfly of light. Her wisdom is from what she has survived and she shares it with the intention to heal. What an amazing book! Reading about Deborah's ordeals on a daily basis while battling Leukemia has completely changed the way I perceive day-to-day stressors in my own life - talk about perspective! What a courageous woman. She will inspire anyone who reads this!! Deborah's book was an inspiring read. Her journal-style descriptive writing makes you feel as if you are on this journey with her - the tears, the joy, the pain... A wonderful book for anyone who has been affected by cancer - or not. Life can be challenging when you are perfectly healthy! Deborah's journey inspires us all to learn from these challenges and enjoy our gifts in life. Bravo! I just finished reading Rebirth. It only took me 12 hours to read it. I could not put it down. I liked the journal form with the medical terminology added to it. It brought back a lot of memories of what Mom had to go through with her port and numbness in her fingertips and toes. Your book really opened my eyes. I take life for granted. I need to live life to its fullest each and every day. I’m looking forward to reading your next published book. I am really enjoying the book. I really enjoyed your descriptions of making the cup of tea - and of the giant bumblebee! You are such a good writer. And your book is really teaching me to pay attention to mindfulness. Thanks for the inspiration. Absolutely awe inspiring! You did a fantastic job of journaling the entire experience. I felt as if I was there with you the entire time. I think everyone who reads will feel the same way. An inspiring story by an inspiring lady! It made me cry. It made me laugh. It made me thankful to still have her around.